Exotic Nut Mix with classy roasted peanuts, almonds, pistachios, macadamias and cashews and crispy spicy flavouring with the oriental spice blend. PEANUT, CASHEW, macadamia, ALMOND, WHEAT, vegetable oil, salt, pistachio, EGG, onion, flavor enhancer: E621, Colours: E150. May contain traces of CORN, celery, lactose, beef, SOY, SESAME, coriander and contain SULFITES. Thinking on Persia, the former kingdom in the heartland of Iran, it takes your mind inevitable to the charming palaces and vast desert landscapes. And it's not just something magic that made all this because even the food has this certain oriental touch. Today, everything characterized by an oriental-Asian style. In our PERSIAN BLEND, we have as well as the Persian-Iranian cuisine that we cared about the harmony of flavours and all our nut kernels, such as peanuts, almonds, pistachios, macadamias and cashews with delicate spices that subsided gorgeous oriental touch of the individual kernels and they all blended together gives us a fantastic bouquet of flavours. It's unbelievable how diverse the Persian-Arabic cuisine presents itself. The snacks have this Asian Food culture that without a question has always been an important place in the Asian culture. So are the salted pistachios included abundant in our PERSIAN BLEND, as well as some other nut kernels, a popular snack and firmly rooted in the great ritual of culinary treats. 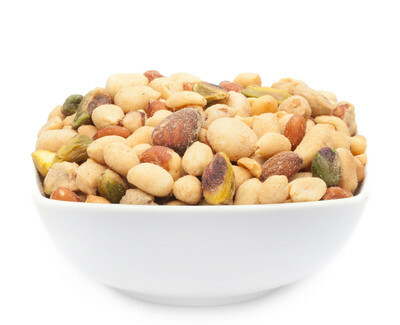 We are proud about what have we done with our peanuts, almonds, pistachios, macadamias, and cashews a nut mixture, creating a flavoured snack with its slightly smoky note for all lovers of the oriental spices. An exotic and oriental nuts mix interpretation with spicy flavouringLet yourself be seduced by our PERSIAN BLEND and dip into the world of One Thousand and One Nights. Taste the unique character of each nut kernels that come with the carefully selected oriental spices and an amazing symbiosis will convince the palate of itself. Just a dream: a warm summer night, a light breeze, the comes on a hot summer day after strolling over Iran's bazaars in the evening finding you with our seductive nuts, and the day can go smoothly until the end.